150 - 8.5" 60 degree triangles makes an approximately 65" x 80" quilt. I am tossing it on the pile to be quilted while I decide on what to use for a quilt back. I have a fabric pull for my next project. I am on a roll!! lol! Yes, remember to make things for yourself, too. Good use of 'special' fabrics. Love the fun and bright colors of the quilt. You have such perfect points! Great quilt top! Hi, I've just come over from Happy Cottage Quilter and so glad I did. We have many things in common and I love your bright and happy quilts. I'm going to follow you and can't wait to get to know you, you will probably inspire me. REALLY nice, Amy. I have been meaning to make something like this, Yours looks exceptionally classy and modern. I love it. Last year I got myself a 60 degree diamond template and I should dust it off and make something amazing like this and impress all of my friends and family. They will think I am an arteeest. I hope you have a marvelous day today. We have sunshine, that is wonderful and perhaps some snow meltage will occur and we can get these Washington DC area kids back to school. It does look like you are on a roll. I have not tried a triangle quilt before but I love how yours turned out. I will have to add this to my "in the future" list. Good job cutting into those special fabrics. That is the hardest part at times. I have a stack of 60° triangles cut - they're here somewhere - your inspiration may be rubbing off on me! It's good to make for oneself! I really love this quilt. I want to make a triangle quilt one day too. How'd you do the cutting/what did you use for the cutting? That navy really pops! Beautiful! Wonderful combination. 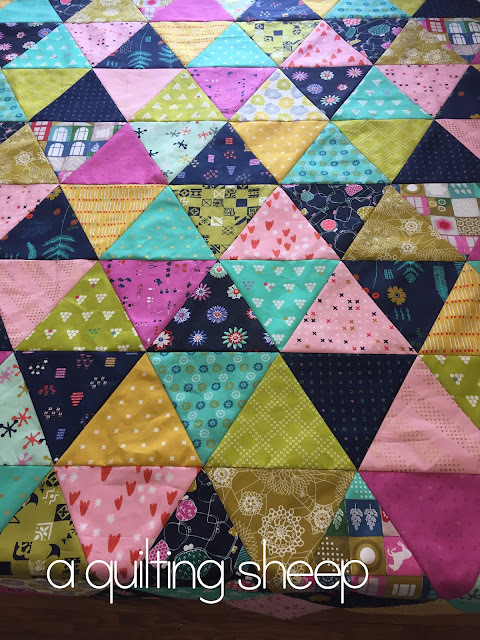 This quilt is going to be so bright and cheerful! Oh Amy you really are on a roll!!! This is wonderful! All your points look amazing!